Gummy bear implants are being hyped as the next best things in cosmetic breast augmentation surgery. Ever since Food and Drug Administration of US gave the go ahead in March 2012 to Sientra, a company that manufactures plastic surgery implants, to manufacture standard silicone gel breast implants in tear-drops and round shapes, the hype around gummy bears has really gone up. Therefore, let us learn what these gummy bear breast implants are. Are they really what they are made out to be? Let us also explore the advantages and disadvantages of these implants, so that you can make an informed decision. Gummy bear implant is a name given to high-strength silicone gel implant. In the medical world, it is called a cohesive silicone gel implant. As the name states, these implants are made of silicone gel. Cohesive silicone gel implant has a semi-solid form, because the material inside it is very dense. The silicone gel breast implant, on the other hand, is in liquid form. There is a very interesting story behind this naming. The name “gummy bear” was given by Dr. Grant Stevens, who is one of the best plastic surgeon in US and is the Medical Director of Marina Plastic Surgery Associates Medical Corporation. His patients kept on asking him to explain what does semi-solid form of these implants mean and how do they retain their shape when cut in pieces. He then came up with the term gummy bears. Comparison between gummy bear candies and high strength silicone gel implants helps us understand what semi-solid form means and how they retain their shape when cut into pieces. Availability As of today, gummy bear implants are available in Europe and Canada. In Europe, they have been available since 1995 and are quite in demand. Canada approved them in 2000 and they have been steadily gaining popularity amongst women. USA started testing them only in 2002. In March of this year, FDA gave the go ahead to Sientra to manufacture standard silicone gel implants in tear drop and round shapes. Though the full go ahead has not been given, it looks very likely that in the near future gummy bear implants will become readily available to the public. There is no doubt that more and more women are enquiring about gummy bear breast implants. Many women have travelled to and will travel to Europe to get their first gummy bear breast implants. It needs to be pointed out that though there is much hype about these implants, it is important not to be swayed by the hype when deciding whether you should opt for gummy bear implant or silicone gel implant. You need to make an informed decision and for that you need to first learn about the advantages and disadvantages of the product. One of the best things about gummy bear implant is its ability to hold its shape. This means that even if it ruptures, it will retain its shape and not leak. We have all heard of cases in which the silicone gel breast implants ruptured and leaked inside the body. Well, with the gummy bear implants you do not have to worry about any leakages, because the material inside them is dense and will not leak out in the event the shell breaks or ruptures. Recent studies have shown that gummy bear breast implants have a much lower leakage rate than other available breast implants. However, it is important to point that the overall leakage rate of gummy bear implants is still not available. Provide Real Shape Another advantage of gummy bear implants is that they are able to provide real looking breasts. Since these implants are made of semi-solid material, they can easily be shaped into a teardrop shape, which is how the real breasts look. Moreover, gummy bear implants retain their shape for very long period of time. This is not so with regular silicone gel implants or saline breast implants. These implants are filled with liquid. Though plastic surgeons try to give them a teardrop shape during the implantation surgery, they usually become round shaped after some time. Moreover, over a period of time silicone gel and saline breast implants become droopy and lose their shape. The gummy bear implants also feel like natural breasts. The gummy bears are soft and squishy and they remain so after breast implantation surgery. The regular silicone gel implants and saline implants would become hard, if they were overfilled. However, with gummy bear implants there is no such issue. These gummy bear implants come in variety of sizes. All you need to do is choose the size that fits your body. Another great advantage of gummy bear implant is that it does not wrinkle, ripple, or fold. This is due to its semi-solid cohesive material. This advantage is not available with silicone gel and saline breast implants. One of the biggest issues with saline and silicone gel breast implants is the formation of capsular contracture. For some reason, fibrous scar tissues begin to form around the implants. Over a period of time these tissues slowly build up and also harden up. This is known as capsular contracture. It leads to pain in the breast and can also cause breast distortion. The issue can only be remedied through surgery and women often need another breast implant. The data so far available shows that gummy bear implants have a very low risk of capsular contracture. One of the main disadvantages of gummy bear implants is that there is not enough data to back them up. Yes it is true that whatever data is available shows gummy bears implants in good light, but the data is not conclusive. Thus one cannot rely on the data completely. Another disadvantage of gummy bear implants is that they require a large incision for implantation purpose. Since they are semi-solid in nature, they cannot be pushed through small incisions like the saline and silicone gel breast implants. The surgeon at least needs to make an incision of 4.5 to 5.5 cm for gummy bear implants. The surgeons usually use the underneath incision with these implants, because these implants are very difficult to insert using the areola and armpit incisions. 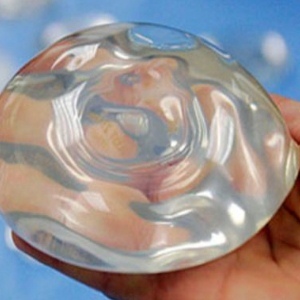 Since these implants are made in teardrop shape, their rotation will lead to breast distortion. However, rotation can only occur if the implant has been fitted inside a loose tissue pocket. This risk is minimized, if due care is taken during surgery. Another disadvantage of gummy bear implants is the possibility of fracture. Since they are of semi-solid nature, there is always a possibility that they can fracture. However, there are no known reported cases of fracture. Thus surgeons do not really know if they can fracture and what happens if they do. The fact is that gummy bear implants have been in use since 1995 in Europe and since 2000 in Canada. So far there has not been much negative news about these implants. However, we still need to wait for the final verdict. If you are thinking about gummy bear implants, make sure that you choose an experienced and certified plastic surgeon for the job.